The YouTube channel has a following and there are now several videos posted about the lights. I’ve also created a concentrated online course about getting started with RGB pixels that takes students through planning out their display and covers everything you need to know to get started in less than 2-hours. It is a paid course designed to get someone up to speed quickly. Essentially, the same material is covered on YouTube videos, but is not as concentrated. I created a custom music track using GarageBand for iPad for the medley. The elves are working on other display elements. I started a YouTube channel called Canispater Christmas teaching RGB Pixel lighting concepts. I had enough people stop by asking how I did the lights last year and wanted to be able to teach people how to do it. Check it out if you’re interested. We have fun. 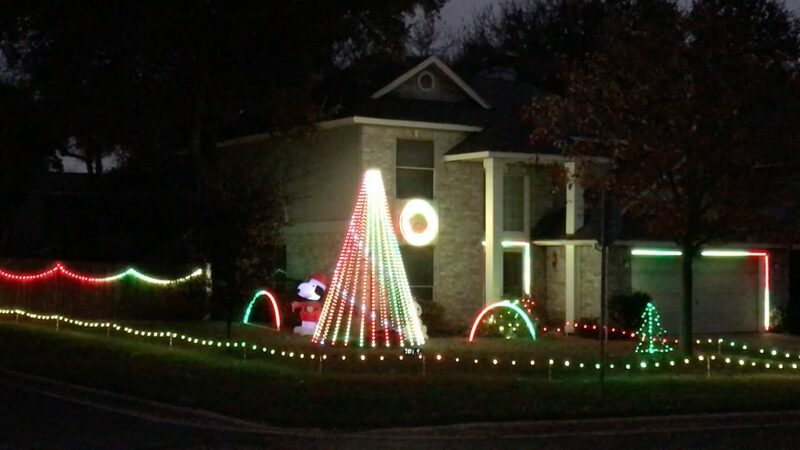 We added a 4’x4′, 288-pixel wreath, replaced the fence LEDs with pixels and synchronized the lights to music for 2016. The sequences were programmed with xLights making it easier to program complex patterns. The LEDs were getting tired in 2014 so we revamped the main tree and outlined the yard, garage and front door with pixels for 2015. Pixels allow for better animation than before possible. I created animation sequences with a custom iPad app that produced a file used by the Raspberry Pi. We’ve created a list of stuff we use and things you’ll be interested in from Amazon on our affiliate page. Pi’s, camera gear and random display stuff. The links take you to the items on Amazon’s web site. If you buy an item from these links, we get a small fee from Amazon’s advertising budget for sending you there. It’s a win-win!